If your freezer’s getting a bit crowded from your last hunt, here’s a suggestion for using that deer roast that got buried under the steaks and sausage. And if that happens to be an elk roast, we don’t see any reason a body can’t substitute that for the venison—probably kicks it up a notch. 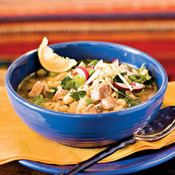 Mexican cooks have been preparing posole (pronounced poh-soh-lay) for centuries. Pork is simmered with chiles and hominy. Taking a posole recipe from chef and cookbook writer David Tanis, who uses pork shoulder and pork belly, here’s a wild game version that will certainly whet your appetite. You’ll notice that we kept the pork belly in the recipe. Remember, “pork fat rules.” Oh, and if you can’t find fried hominy, use canned. Drain and rinse, then add during the final 1/2 hour of cooking. 1. Drain the soaked hominy and put it into a Dutch oven or large soup pot. Cover with water and bring to a boil. Let simmer briskly for 1 hour. 2. While the hominy is cooking, toast the dried chiles by placing them in a cast-iron skillet over high heat and shaking and turning them until slightly charred and fragrant. Slit the chiles lengthwise with a knife (you may want to wear gloves), and remove and discard the seeds and stems. Place the chiles in a saucepan with 4 cups of water and simmer for 30 minutes. Let cool. Transfer the chiles to a blender and purée to a smooth paste, adding just enough of the cooking water so the purée has the consistency of a milkshake. 3. Generously season the pork belly and venison (or elk) with salt and pepper. When the hominy has cooked for 1 hour, add the meats, onion, garlic, bay leaf, and cumin. Add enough water to cover by 2 inches and return to a simmer. Simmer over low heat, uncovered, for about 3 hours, occasionally skimming fat from the surface and adding more water as needed. Test the meat for doneness; it will be very tender. The hominy will be soft but still chewy. 4. Stir in the chile purée and simmer for an additional 10 minutes. 5. To serve, ladle the stew into bowls, and allow guests to garnish their bowls with the chopped white onions, cilantro, and lime wedges. What you end up with is enough for 8-10 servings. Thanks to Field & Stream for allowing us to tinker with this recipe.